What is your best story in Age of Wushu Dynasty? We'd like to know! 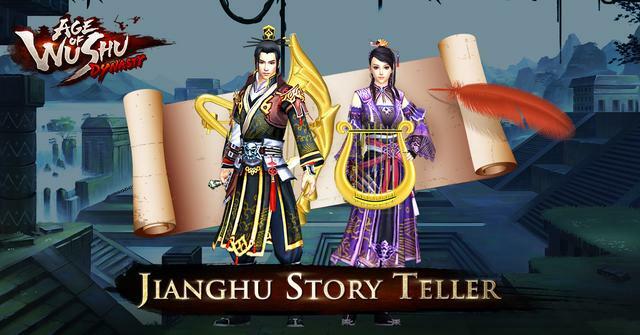 Share your tales of adventure in the Jianghu Storyteller Event! Step 1 - prepare your picture as a .jpg or .png file. Ideal photo size should be less than 700 px wide and shorter than 400px tall. Step 2 - upload the picture. Below your post, you will see th "Upload Attachment" function. Find the picture on your computer, select it, and then click "Add the File". You can also then use the "place in-line" function to have the picture show up in your post. Step 3 - don't forget your info! We need your IGN and server in order to send you rewards! Step 4 - be awesome! Conquering Jianghu, Is a tough Job for a Shaolin Role. But, We're trying to do our Best to Be a top Jianghu Conquerer someday. Shaolin Known as : Bald, Slow, Underpowered, Or Not good In everything. But we as a Shaolin user we're trying do our Best just to Show them that were worth it School than the Others. We may not be a Game Ruler, But we Fight And we Stand for Our School In every War. I want to add a Picture on it, But I don't know how?. Once upon Jianghu, I was deceived by evil forces who promised me great power. This blocked my road to Enlightenment, making me a master of the Drunken Fist, suppressed by alcohol, and a disgrace to the Shaolin. Years later, my school decided to elect a Grandmaster and a council to help abbot Xuanhuai, as the number of disciples had largely increased. I looked at the candidates, which were way more powerful than me, and I was surprised; all of them used a staff! But how was that possible? Drunken Fist is gold, better than silver and bronze staff techniques! I decided to start using Ruthless Staff and despite my power dropping by 7000 I was able to take out opponents not even my Drunken Fist could! That day, I understood something very important; skills over power. Then I shaved my head and put on my robe again. For this is the Way of the Shaolin, and it is AWESOME!!! A great body is temporary, although important. A good soul lasts forever. My power so child. But I have many friend in guild. They r all who helped me to understand how to play. We r not strong. But we can together to strong. I hate player who just like gold from guildraid award. Many player leaving us guild. Because my guild so child and doesnt exist at the top. They r all who have great power leave us just for mini gold. "Out bro, go away. Eat ur gold from ur new big guild". But all my friend in guild who have the same idealistic never leaving guild. Because we have dream to tell a sycophants. That we will going to top. So a licker can see us. That we not just kidding. And us idealistic is the power canT make u winner. But togetherness can make us to the top. And now us guild rank 3 from the bottom rank. not just words and a place for sycophants. In Eu S2, we lost guild war 9 weeks straight. Now we finally won Guild war and rank1 in EU S2, wanna hear our story how we did it?